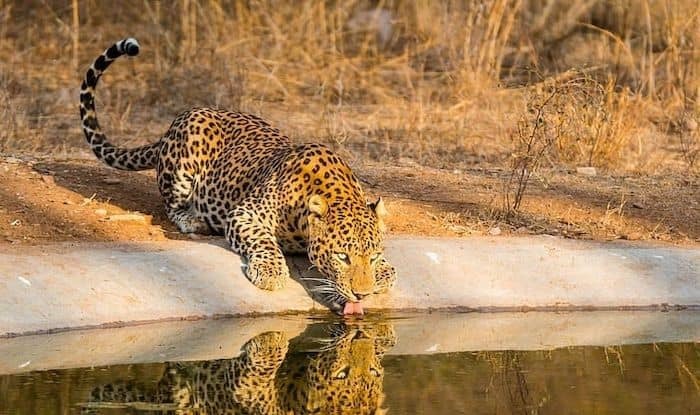 Set at the foothills of the Aravalli range, Jhalana Safari Park is one well-maintained primitive wilderness a few kilometres from the city of Jaipur. The park is home to the elusive apex predator: the leopard and is a great place for spotting various types of flora and fauna all year round. For those who can never have enough of wildlife safaris, there’s one here that takes you for spotting the elusive big cat. The leopard is one of the most resilient, adaptable and wide-spread big cats in India. What’s interesting is that their elusiveness and behavioural flexibility allows them to survive near villages and human settlements. The forest used to be an exclusive property of the erstwhile Jaipur king; who used it mainly for sports and also to source fuel, fodder and timber for the neighbourhood villages. Today however, it is open to wildlife enthusiasts and nature lovers. You can take an open gypsy safari here and set out to witness the big cat in its natural habitat. The view of the jungle from the gypsy is absolutely breath-taking and as you enter the Wild Zone inside the park, expert guides help you spot animals which mostly camouflage themselves while sharing their in depth knowledge about wildlife behaviour. At Jhalana you can spot animals such as the striped hyena, desert fox, golden jackal, chital, and Indian palm civets. It’s also great for bird-watching, where you can spot many species like the Indian pitta, dusky eagle, owl, spotted owl, golden oriole, flycatcher, shikra, and nightjar. The park also boasts of housing a good number of reptile including 9 snake species and 2 monitor lizard species. You can take a flight to Jaipur and then hire a cab to Jhalana Safari Park, located in the Malviya Industrial Area about 5km from the city centre.